FLOWERY BRANCH, Ga. (AP) — Calvin Ridley is going through quite an adjustment. During his college days at Alabama, he hardly knew what it was like to lose. The receiver already has tasted more defeat in his rookie season with the Atlanta Falcons. Expected to be one of the NFL’s stronger teams, the Falcons are probably the most disappointing through the first five weeks of the season. Stricken by an epidemic of injuries and plagued by a bunch of close losses, Atlanta (1-4) already faces a three-game deficit in the NFC South and essentially has no more room for error. This certainly wasn’t what the Falcons expected, just two years removed from a trip to the Super Bowl and coming off another playoff appearance last season, when they went right to the wire with the eventual champion Philadelphia Eagles. But Atlanta got a sampling of what kind of season it was going to be in the very first game. In a prime-time rematch against the Eagles, the Falcons drove to the 5-yard line for the final play of the game but couldn’t connect on a potential game-winning pass to Julio Jones . Making the loss even more devastating, safety Keanu Neal went down with a season-ending knee injury and linebacker Deion Jones sustained a serious foot injury that will keep him out at least half the year. After holding off Carolina 31-24 in the home opener, the Falcons lost their next two games at Mercedes-Benz Stadium in heartbreaking fashion. New Orleans rallied for a tying touchdown with 84 seconds left in regulation, then won 43-37 in overtime . That was followed by Cincinnati connecting on a TD pass with 12 seconds remaining for a 37-36 victory . The injuries continued to pile up as well. Free safety Ricardo Allen , one of the team’s most inspirational leaders, and offensive guard Andy Levitre both went down for the season, while running back Devonta Freeman missed three games with a bruised knee and Grady Jarrett was sidelined by a sprained ankle. 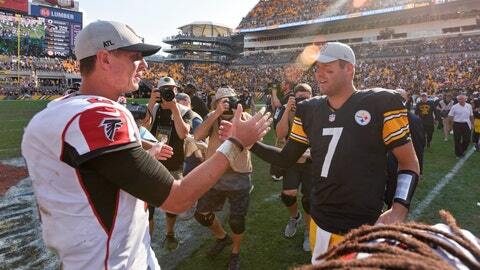 Last weekend, the Falcons had a total meltdown at Pittsburgh. The Steelers ran wild in the second half, scoring four touchdowns on the way to a 41-17 blowout . It was the second-worst loss of Dan Quinn’s coaching career, surpassed only by a 38-0 rout by Carolina in 2015 — his rookie season at the helm. Perpetually upbeat and one who favors slogans and themes to motivate his players, Quinn doled out T-shirts that he hopes will help snap the Falcons out of their slump. “Own Now” is emblazoned across the front. The most pressing concern is an atrocious defense, which simply hasn’t been able to deal with the loss of three key players (and it was four last week, with Jarrett on the sideline). For the first time since 1987, the Falcons have surrendered at least 37 points in three straight games. Before this stretch, that Carolina debacle from three years ago was the only time Atlanta had given up that many points in a game during the Quinn era. Missed tackles have been a major issue. There were at least 10 against the Steelers, prompting Quinn to devote additional time in practice to basic fundamentals. “We’ve got to get it shored up with some of the men who need extra work,” he said. The special teams are another troubling issue. The Falcons have given up blocked punts in two of the last three games, both times on plays where the rusher simply beat his man. The offense has been more productive under second-year coordinator Steve Sarkisian, but striking a balance between the running and passing games continues to be an issue a times. The Falcons ran just 19 times for 62 yards at Pittsburgh, while Matt Ryan and backup Matt Schaub combined to throw 45 passes. The Steelers were able to tee off on Ryan, who left late in the game with a foot problem after getting sacked for the sixth time. At least the Falcons got some good news when it comes to their star quarterback. Ryan was back at practice Wednesday and said afterward that his injury was nothing serious. He’s eager to turn things around, beginning with Sunday’s game against NFC South rival Tampa Bay (2-2). The Falcons haven’t started 1-5 since 2007, a lost season marred by Michael Vick going to prison for dogfighting and coach Bobby Petrino abandoning the team with three weeks to go.